With over 15 years of combined experience in Mechanical Design, Structural Analysis, Automotive Data Systems, and Product Development WolfKatz Engineering LLC can help you solve a variety of technical problems. The Gharib Research Group at Caltech is developing a completely new method for flow visualization. This method uses proprietary three dimensional digital cameras that use multiple ccd's (charge coupled device or the area of digital camera that acts as the film). These multiple ccd's are designed and controlled via custom software to create a 3D movie showing the flow developing and changing. The Gharib Group contracted with WolfKatz Engineering LLC to design and oversee construction of the physical camera body and electronics packaging. 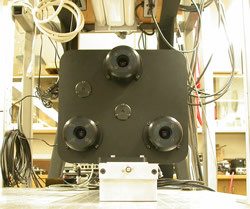 Working with graduate students at CALTECH, WolfKatz designed the camera body shown here. This project required extremely tight tolerancing to ensure that the ccd's were properly placed. Careful attention was as paid to all required optics whose placement is also absolutely critical to make the completed camera operate properly. 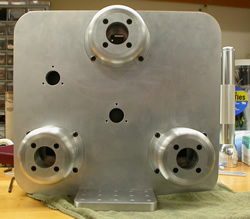 Assembly of the final product was done in a clean room located at CALTECH. With some prodding, the camera went together on the first try and is an on-going success. Someday, new and exciting studies will allow us to better understand each and every fluid we live in including the air we breathe and water we drink! Work on cameras and other high precision equipment is on-going. 1) Cooling, warming, or microclimate conditioning of individual human beings to improve personal comfort, health, and endurance. 2) Providing thermal management solutions for electronic components and assemblies in confined spaces. 3) Developing TE-based direct thermal to electrical energy conversion technology that is commercially and militarily viable. 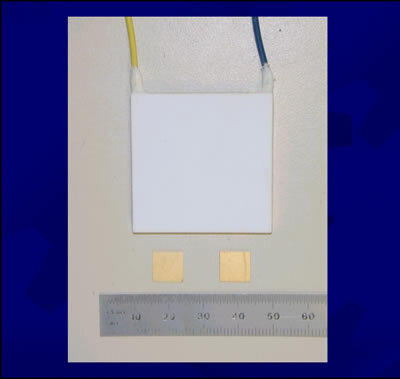 TE-based thermal technology involved the use of thermoelectric (TE) devices to create hot and cold liquids and environments as well as to produce electricity. Thermoelectric technology moves heat from one location to another when direct current electricity flows through specific configurations of thermoelectric materials as thermoelectric devices. TE devices (TEDs) working in this way are functioning as solid-state heat pumps. A single thermoelectric device can heat or cool, with the action determined by the direction of current flow through the TED. While much of the recent attention given to thermoelectrics has focused on its ability to cool and heat, thermoelectrics can also be applied to generate power from a specific heat source. WolfKatz Engineering LLC has been under contract to assist with in vehicle integration of many of BSST's newest technologies. Work has included systems level engineering, project management, and direct design and testing of various new automotive technologies. With many projects funded by tier one automotive suppliers, a large amount of resources are put into these projects. What soon for large changes in the way your local climate is controlled! Work with BSST is on-going.